Did you put anything in place so that you could be contacted quickly once Labour began? I was in the fire service at the time so I had plenty of friends around me. My partner Helene had several of their mobile numbers and of course a direct line to the watch and station managers landline phone. How did you support your partner during labour? We attended hypo-birthing classes together and practiced this throughout pregnancy and labour. This helped prepare me and ensured I was very much part of the labour and the decision making throughout. I helped with breathing and giving sips of coconut water to keep her strength up. Did your partner and/or the babies need to stay in hospital over-night or longer? They all stayed in for two nights. We had our own room which made life a lot easier. Were you able to stay with them and how did you cope during this time? I stayed (slept on the floor) on the second night. Coping was fine, although we were new parents we had a good support network around us and the midwives & doctors were amazing. How long was your paternity leave? Because of my shift pattern and a little leave I had saved I have nearly 1 month off but only took 2 weeks with the twins as I had a new business and we luckily had family on hand. For our third child I took 2 weeks and I would suggest to any new twin you take at least this time off. What support were you able to give during Paternity Leave? As a twin dad you HAVE to be involved. Whether that is changing nappies or helping with feeding positions just to be there on-hand whenever needed is vital. One of the main jobs is to have a system in place for dealing with the running of the household. Tip – Make sure you know what your other half does! What I mean is that if she always orders the online shopping, sorts the recycling out or pays the window cleaner make it is your job to find out all her jobs upfront and sort it all out. What was the most difficult thing about returning to work? Think my situation was different to many as my shifts enabled me to spend a lot of time with the family. I had no real difficulties at all. Were you able to help with feeding? Yes. I think this is a key role for twin dads. Understanding how to help position the children to enable them to successfully (or at least attempt) breastfeed was something I took seriously. 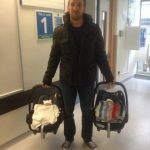 Listening to the midwives and experts was brilliant for me and both twins learnt to feed pretty quickly. Also 3 months in, we used to alternate breast and bottle and so I would be involved during the bottle part and I could take over at times to give Helene a long stretch of sleep when she was exhausted. What is your favourite activity to do with the twins? A tough question as I love spending time with them. Sometimes the most simple activities are the best. Pushing them in a shopping trolley can quite often result in their funniest moments. But my favourite is starting them off with something creative and then standing back and watching what unfolds. What is the best thing about being a dad to Twins? Honestly, watching their relationship and how it develops. Their ability to understand each other and quite often to collaborate is amazing. 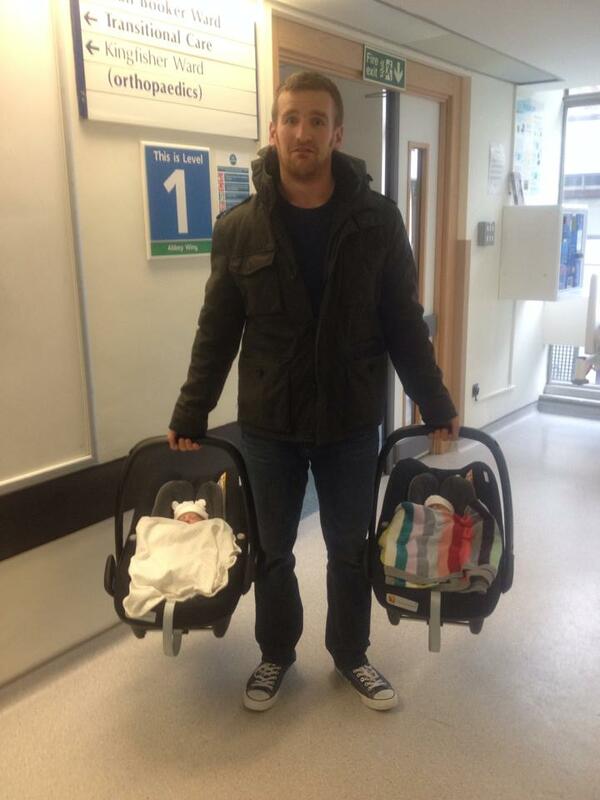 What is the most challenging thing about being a dad to Twins? Ensuring you spend enough time with them separately as individuals. I’m very much still working on this one. What advice would you give to your pre-parent self? As boring as it sounds I would tell myself to sort all those little DIY jobs around the house that I put off. My pre-twin dad tip: People like telling you ‘how hard’ its going to be, don’t listen to them, its not hard. Its an amazing rewarding challenge. My just born twin dad tip: Keep relaxed and enjoy it.